DENVER, Colorado--Round and round it goes, and where it ends up is a matter of aerobraking for the Mars Reconnaissance Orbiter, NASA's newest spacecraft to explore the red planet. Aerobraking is "science friction"--that is, using the friction of the thin martian atmosphere to slow the orbiter. Mission officials keep an eye on things like glide slope, drag passes and pop-ups while also watching the weather and looking out for other spacecraft. Mars Reconnaissance Orbiter (MRO) is making controlled skims through that planet's tenuous upper atmosphere to convert the spacecraft's initial, very elongated 35-hour orbit to a nearly circular two-hour orbit needed for the mission's science observations. A combined team both at the Jet Propulsion Laboratory (JPL) in Pasadena, California and here at a Lockheed Martin Space Systems control center plot out and perform MRO's dainty, ease-on-down, maneuvers. "We're on schedule ... definitely right on the plan. It's going really well," said Wayne Sidney, MRO Flight Engineering Team Lead for Lockheed Martin Space Systems, the firm that designed and built the spacecraft. MRO arrived at Mars on March 10 and inserted itself into orbit. Thanks to aerobraking, the spacecraft's 35-hour orbit period has been shaved down to a 20-hour orbit, but hundreds of drag passes are ahead. "We've still got a long ways to go," Sidney told SPACE.com. The process uses short blasts from MRO thrusters while the spacecraft is at the far end of its orbit, called the "apoasis." The burns are used only to adjust how deeply the spacecraft dips into the atmosphere at the near end or "periapsis" end of its orbital ellipse--where the orbit comes closest to the planet. Sidney said the first steps to enter the atmosphere of Mars-- a "walk-in" or "toe dipping" phase--have been completed. Now underway is the main phase of aerobraking that lasts several months, concluding with a "walk-out" of the atmosphere. If all goes as planned, MRO aerobraking is scheduled to end around early to mid-September, Sidney added. "The more you slow down ... the more you kind of fall into the planet." Compared to relying only on rocket engines to shape orbits, aerobraking reduces the amount of fuel hauled on a spacecraft by nearly one-half. This is the reason for aerobraking, a procedure NASA has used with success for the Mars Global Surveyor and Mars Odyssey orbiters now circling the red planet. "MRO is a culmination of lessons learned from those two spacecraft," Sidney said. "For those two early pioneers it was kind of virgin territory where we were going." MRO was fabricated, optimized, and beefed up to take the buffeting and heat from aerobraking. For example, the craft's large set of solar arrays are designed to go up to 175 degrees centigrade (347 degrees Fahrenheit). "The highest we've seen to date is minus-three. So we haven't even cracked a zero at this point in time," Sidney explained. Mars itself has been good to MRO ... so far. No dust storms appear to be brewing. The atmosphere of the planet is "clear and quiet," Sidney pointed out. "I'm not going to say it has been a walk in the park ... but it has been a picnic in comparison" to the last two NASA orbiters and their respective aerobraking activities, he said. Generally, the density of a planetary atmosphere decreases with increasing altitude. However, Mars' upper atmosphere is quite changeable in how dense it is at any given altitude. Up to now, the amount of time MRO is in the atmosphere at periapsis has been on the order of five minutes duration. Later on, towards the end of aerobraking, MRO will experience some 20 minutes of atmospheric drag. If spacecraft operators run into a problem during aerobraking, say too much stress and strain is being felt by MRO, a pop-up maneuver can be done to prevent damaging the spacecraft. Onboard MRO is a Periapsis Timing Estimator (PTE). Using very precise accelerometers and a computer algorithm, the spacecraft can predict orbit period changes from one orbit to the next. Trial-running this think-for-itself, auto-navigation approach may lead to wider adoption of the PTE in the future. PTE number-crunching is being gauged against the output from the traditional, navigation prediction team work here on Earth, with very favorable results, Sidney said. "We kind of have our own little navigator onboard MRO ... the two methods line up very, very well." 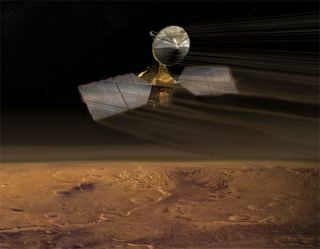 The whereabouts of MRO relative to other Mars orbiters now busy at work--Mars Global Surveyor, Mars Odyssey, and Europe's Mars Express--is a daily output from collision avoidance analysis, Sidney said. And there has been an "interesting little dance" with Mars Odyssey, in particular, he added. While having a fleet of orbiters circuiting Mars has relayed a bonanza of data, precise knowledge of MRO's orbit, given its aerobraking aerobics, is top priority. But there's more of a sweat factor when you mix in the orbits of the Mars moons--Phobos and Deimos--and the unknown locations of two Viking orbiters from the 1970s that are thought to be still zipping around Mars. All orbiters are supposed to be in Quarantine Safe Orbits, which requires a minimum lifetime of 50 years circling Mars. So it's believed that both Viking Orbiters are swinging around Mars too--silent sentinels that ran out of attitude control gas early on in their missions. With each loop around the red planet, the $750 million MRO mission draws closer to the day when its science gathering tasks can begin. Following months of aerobraking--512 dips through the atmosphere--MRO will be locked into the desired time-of-day pattern for the mission's science phase. "It all has to come together," Sidney observed. The orbit will remain at a fixed angle to the Sun; every time the spacecraft passes northbound over the equator, it will see mid-afternoon lighting on the ground. A complete orbit will then take about one hour and 52 minutes. By the next time MRO loops around and crosses the equator again, Mars will have rotated just enough that the spacecraft sees the same time-of-day on the ground beneath it. A key objective of MRO is to search for evidence that water persisted on the surface of Mars for a long period of time. While other Mars missions have shown that water flowed across the surface in the planet's past, it remains a mystery whether water was ever around long enough to provide a habitat for life. "It's going extremely well ... it really is," Sidney concluded. "We're on the glide slope ... right on track to keep moving forward."